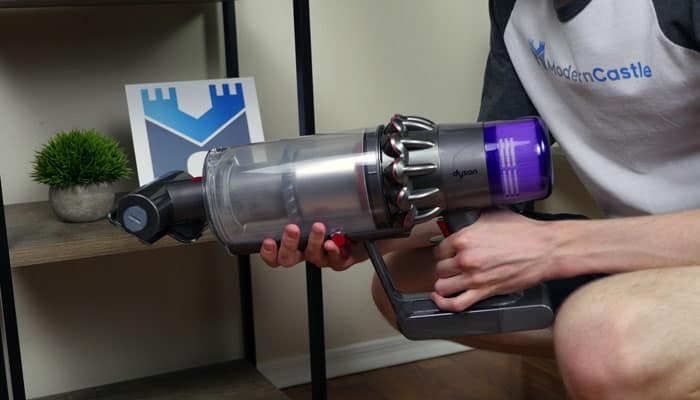 Our Dyson V11 review is finally here! 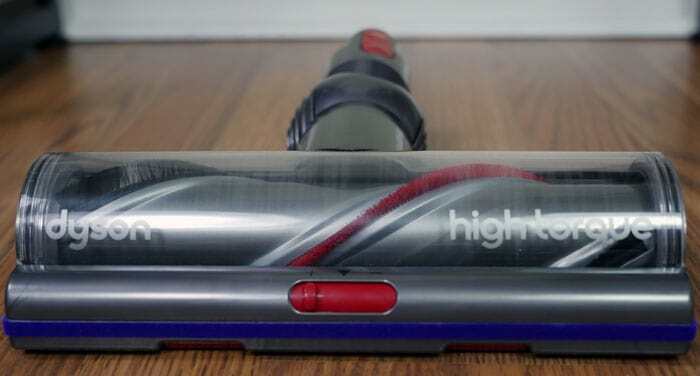 This vacuum is the newest cordless stick vacuum to the Dyson lineup. It offers many advanced features introduced with the Dyson V10 last year (see our review), but with some new additions. The advanced V11 motor offers 20% more cleaning power over the Dyson V10 motor. The Dyson V11 has a similar look and feel to its recent predecessor, the Dyson V10. It has the cordless stick body with trigger power controls, in-hand dust bin, and versatile cleaning heads and attachments. Emptying the dust bin on the V11 is virtually identical to emptying the dust bin on the V10. Unlike the older models in the “V-series” lineup, the V10 and V11 share a sort of “point and shoot” style for emptying the dust bin. This style is intended to make sure that debris doesn’t get caught in the dustbin. While the V10 was a bit more difficult to empty, the V11 design seems a bit more polished. As a result, it was much smoother and easier to empty. Also similar to the V10, the V11 has the same long dust bin that runs in-line with the upright wand of the vacuum. This design is said to result in better airflow and stronger suction, compared to the V6 or V8 models. Concerning color finishes of the V11, there are a few different choices. All three of these color schemes look pretty consistent, with the main color difference being in the color of the wand. 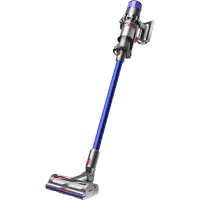 The cleaning style of the Dyson V11 is similar to that of the V10. The V11 relies heavily on the two-tier radial cyclone system, which is the same basic system as what we saw with the Dyson V10. Unlike the V10, the V11 steps it up a notch, by also including advanced floor sensor technology that automatically adjusts the brushroll as needed to accommodate flooring of different heights. One change that we see with the Dyson V11 is the cleaning head… or lack thereof. The Dyson V10 Absolute includes a soft roller head, designed primarily for cleaning hardwoods. If you’ve been a fan of Dyson for some time, you may remember other models through the years that were designated as “Fluffy”. These Fluffy models also included the soft roller head. 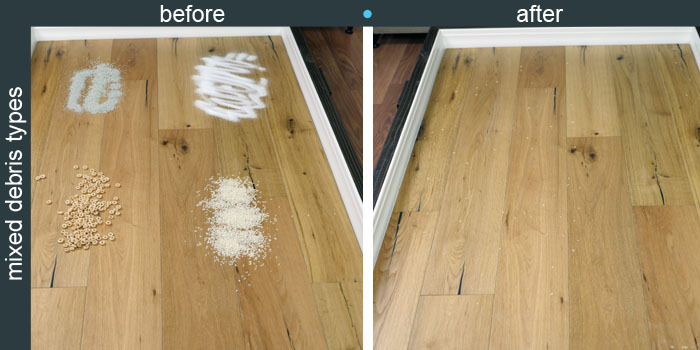 During our cleaning performance tests, we found this model to be a little better at capturing debris from hardwoods without blowing it around the floor. Neither the Dyson V11 Torque Drive or the Animal model include this soft roller head. To be completely honest, I am both surprised and disappointed that it wasn’t included. While the overall cleaning performance of the V11 (see down below) was still quite good, I think the soft roller head makes a noticeable difference on hard surfaces. The Torque drive cleaning head is the only cleaning head included with the Dyson V11 (with either the Torque Drive or Animal model). The Torque Drive head is designed for all floor types, but especially excels on carpeted floors. It has a powerful brushroll that spins up to 60 times per second. When the primary cleaning head is not in use, smaller attachments can be used to turn the V11 into a handheld vacuum. As a handheld, the Dyson V11 has the same sized dust bin and motor as when used as a cordless stick vacuum. The suction may vary based on the exact tool that you attach at any given time. RELATED – See our full list of Dyson vacuum reviews here. How big is the Dyson V11? 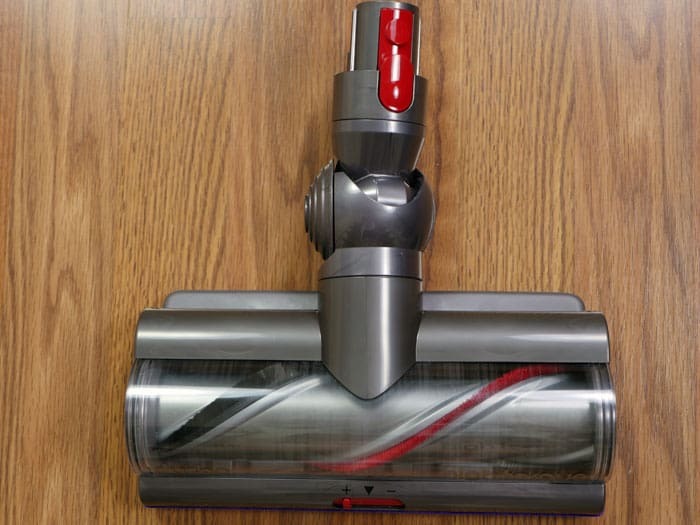 The Dyson V11 vacuum is about the same size as the Dyson V10, measuring 50.6” long, 9.8” wide, and 10.3” high. What accessories come with the Dyson V11? Regarding accessories and parts, they both basically come with the same extras. The main difference here is that the V11 Torque Drive model comes with a soft dusting brush, which the V11 Animal does not include. Here is a shot of all of the parts and accessories included with the Dyson V11 Torque Drive cordless vacuum. Extension wand: This wand is most frequently used when the V11 is in upright stick vacuum mode, but it can also be used to extend user reach when in handheld mode. The red button on the end can connect to a cleaning head or to any of the handheld attachments. Nickel Toque Drive cleaning head: This is the primary cleaning head used for floor cleaning when in stick vacuum mode. This head uses spiral bristles to agitate and capture debris from the floor and deposit it into the dust bin. Mini motorized tool: This attachment is useful when using the V11 as a handheld and can really provide a power boost when cleaning fabrics, upholstery, or pet hair. Combination tool: This tool provides the function of a short / wide crevice tool as well as a soft dusting brush. It’s versatility makes it nice when cleaning indoor spaces like couches and furniture, as well as when cleaning your car. Crevice tool: This tool is longer than the combination tool and provides a narrower opening for capturing debris; great for in between couch cushions, behind furniture, or other hard to reach spaces. Mini soft dusting brush: This attachment has soft bristles that are close together and provides a nice dusting tool that doesn’t damage furniture or sensitive surfaces like automobile interiors. Stubborn dirt brush: This brush has bristles that are slightly further apart than the bristles of the dusting brush and they are also much firmer. This is a handy tool for scrubbing dirt from hard surfaces like floor tile or heavy-duty abrasive textiles. Docking station: The docking station provides a simple wall-mounted spot for your Dyson to hang when not in use. This accessory can also hold 2 accessories for easy access. Charger: The charger plugs into a standard wall outlet and lets the Dyson juice up in between cleaning cycles. For comparison, the Dyson V11 Animal includes all of the parts and accessories listed above, EXCLUDING the soft dusting brush. So we know that there is a slight difference in accessories between the Torque Drive vs. the Animal, but are there other differences? The accessories is actually one of the most minimal differences between these two models. The main difference between the Torque Drive and Animal models is the screen in the back of the handheld unit. The Dyson V11 Torque Drive model comes with an LCD screen that displays performance in a run time countdown in real time. The LCD screen also makes it easy to switch cleaning modes (Eco, Auto, or Boost). The Torque Drive screen also can show you videos on how to maintain the machine. 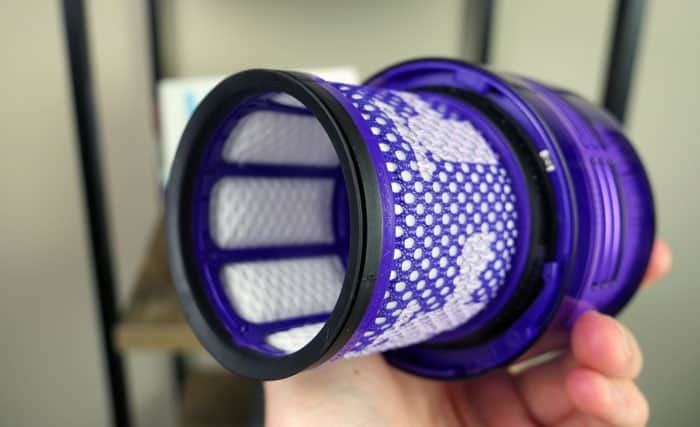 For comparison, the screen on the Dyson V11 Animal is an LED screen that is a little more basic. It still displays an estimate of remaining battery life (as an illustrated icon, not a real-time countdown). Also, you can still easily switch cleaning modes as necessary (Eco, Auto, and Boost). Run time ~60 mins. ~60 mins. 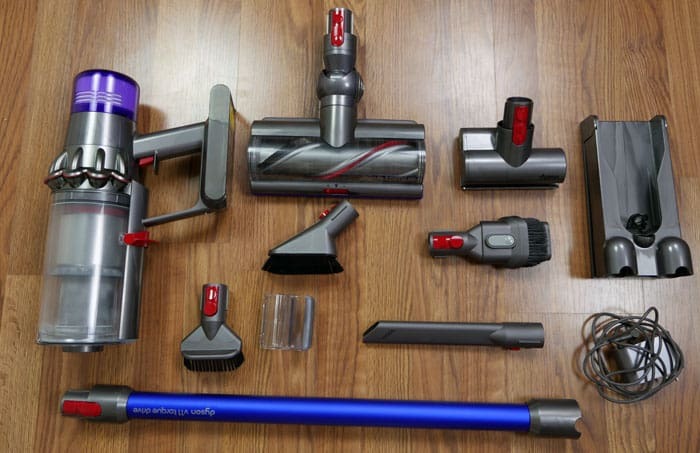 The following vacuum cleaner tests are designed to show how the Dyson V11 performs on different surfaces, picking up a variety of debris types. On hardwood floors, the Dyson V11 had excellent cleaning performance. Although it ultimately didn’t effect the overall cleaning performance, I do want to note that not having the soft roller cleaning head lead to less-than-perfect performance. While the Torque Drive cleaning head rolled across the hardwoods, it had a tendency to fling debris across the floor before sucking it up, especially with our rice test. Like I said, there wasn’t a huge difference in total debris cleaned, but it feels necessary to include this detail. 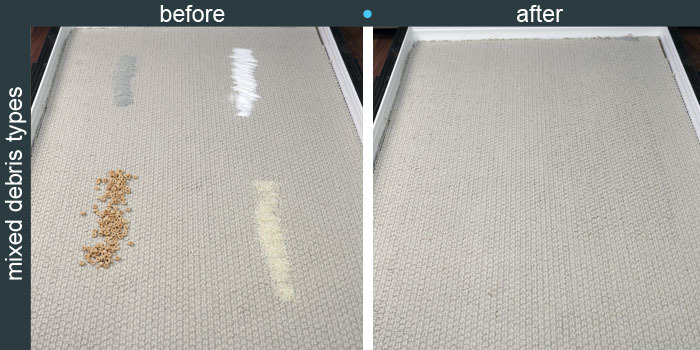 On low carpets, the cleaning performance was virtually flawless, collecting 100% of debris testing. Not much else to say about except for that we were impressed. On high carpet, the results were basically identical to the low carpet, capturing 100% of all debris types except for cereal where it still captured 99%. Overall, we were impressed with the cleaning performance of the Dyson V11 on carpeted floors. How easy is the V11 to use? The Dyson V11 Torque Drive is a breeze to use and setup. For initial setup, all you need to do is unbox all the parts and charge up the main handheld vacuum. A full charge takes about 4.5 hours with a completely drained battery. You can also attach any of the handheld attachments directly to the cleaning wand extension piece for hard-to-reach cleaning, like dusting moldings or reaching in crevices behind furniture. All of the tools attach via a quick-release button that makes it easy to slide in different tools as needed. The Dyson V11 has advanced technology that allows it to automatically adjust suction based on floor type. Unlike the older V-Series models, which had an optional “MAX” suction setting, this new advancement takes the guesswork out and keep from wasting any battery life. Maneuvering the Dyson V11 is similar to the V10 and other earlier V-series models as well. It has a simple trigger button that lets you only vacuum when you need the suction. The wand is flexible and the base easily swivels to allow for tight 90° turns. There are no wheels on the cleaning head, but the brushroll navigates smoothly and its lightweight to push or carry. As mentioned above, you can use the handheld with just the body or you can attach the wand for extended reach. All of the accessories can attach directly to the handheld body or the wand, when used as an upright stick vacuum. Maintaining the Dyson V11 is critical to maintain peak performance of the vacuum. By keeping up with regular maintenance you can decrease the chance of needing to prematurely replace parts or accessories. Regularly emptying the dust bin. Replace the battery as needed. The Dyson V10 battery is supposed to last up to 15 years, according to Dyson’s founder, James Dyson. We haven’t seen a statement from Dyson on V11 battery life, but we expect it to be at least as good as the V10. With a lifetime washable filter and a battery that should last the life of the unit, it should cost effectively $0 / year in maintenance costs. While the initial cost of the Dyson V11 vacuum is steep, the low maintenance costs do help to offset it. How loud is the Dyson V11? How long does the Dyson V11 battery last? 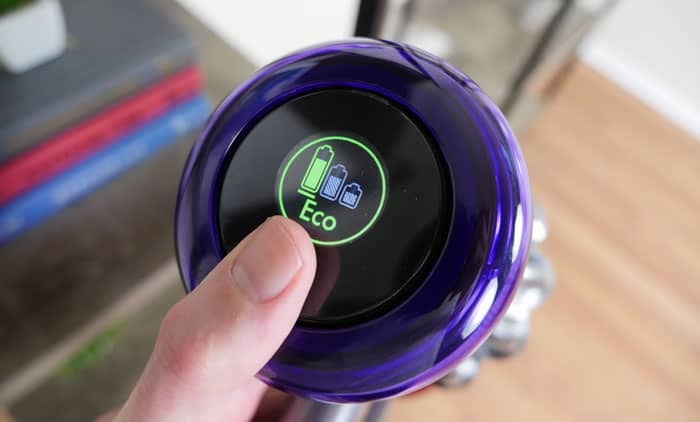 The battery on the Dyson V11 can last up to 60 minutes, depending on the type of cleaning that you’re doing. Is the Dyson V11 a good value? So overall, is the Dyson V11 Torque Drive worth the cash and all the hype? I would say that yes, this vacuum is a good value. While the price tag is not cheap by any means, it does offer exceptional performance and nice upgrades over the V10 model, including intelligent suction and the LCD screen at the back of the vacuum with handy notifications and performance details. As a downside, the V11 does not include the soft roller like the V10, and honestly I can’t say exactly why it doesn’t. On previous models, I felt like the soft roller head is a nice addition and really helps to book performance on hardwood floors. I think that’s definitely something that the V11 is lacking, but at the end of the day, the cleaning performance was not dramatically impacted. 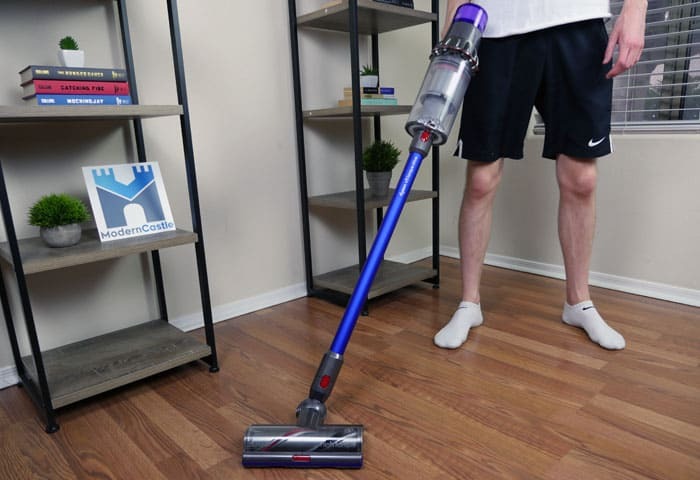 For users who are looking for a high-preforming cordless stick vacuum with an excellent run time, and intelligent usability, the V11 is certainly one of the best cordless vacuums on the market today. Who Should Buy the Dyson V11 Vacuum? If you like the “latest and greatest” and are looking for a quality lightweight vacuum to help with a wide range of cleaning tasks, the Dyson V11 could certainly be for you. Want an advanced digital screen: Whether you go with the V11 Animal or the V11 Torque Drive, both models offers an advanced digital screen with more notifications and settings than previous models. The V11 Animal has an LED screen that shows an estimate of remaining battery life as well as simple controls to change cleaning mode. The V11 Torque Drive has an LCD screen that shows a more accurate battery life assessment with a real-time countdown of minutes remaining. The Torque Drive also offers performance details and maintenance videos. Want automatically adjusting suction based on floor type: The V11 also has the advanced feature of automatically adjusting suction for different floor types. This is an advantage over the Dyson V10 and can help to save battery power where you can, for a run time of up to 60 minutes. 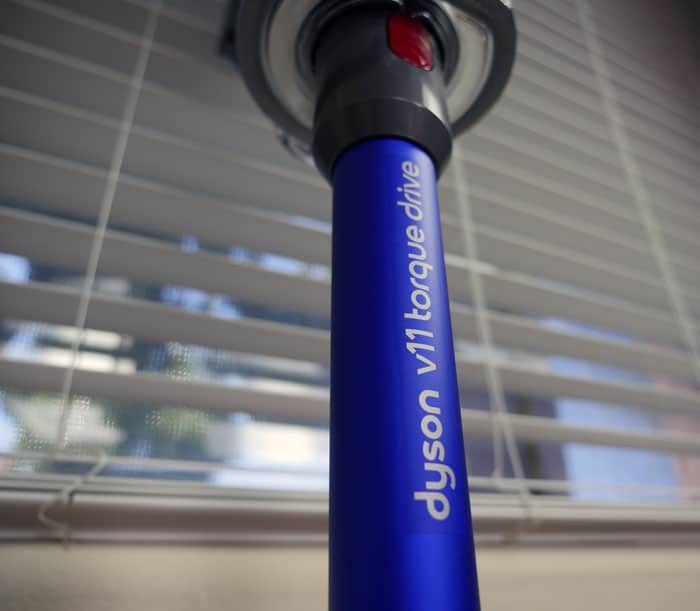 Want 20% stronger suction over the V10 model: The Dyson V11 offers 185AW of suction power, which is 20% more than the most powerful suction available on the V10 model. This is due to the advanced V11 motor. This is the most suction power of any cordless vacuum we have seen to date. Want more information on the Dyson V11? Check them out on Amazon or Dyson.com. Have a question? Drop us a comment below. We’re always here to help. The Dyson V11 Torque Drive is arguably the best cordless vacuum ever built. Intelligent sensors allow the V11 to automatically adjust suction. With 3 power modes the V11 is capable of running for up to 60 minutes and cleaning virtually any surface or furniture you can throw at it. At up to 185 AW of suction on Boost mode it has enough power to clean carpets of all types. It’s expensive, no doubt, but it’s also the best money can buy. very full review. thanks Derek. You get a little less suction with the V10 vs. the V11, but it’s still more than sufficient. While the intelligent suction and display features are really cool, they aren’t really changing how the vacuum performs. I also don’t love that the V11 doesn’t include a soft roller brush, but the V10 does. For these reasons I would go with the Dyson V10 in most cases. Thanks for the extensive review, its helped me decide on the v10 because of extra accessories Included. Our pleasure. I’m glad we could help! Great review! I was trying to decide on which vacuum would be the best to buy. I had almost convinced myself that I needed the V11. I have never had a Dyson before. I have a Kirby which I love except for my wood floors. I have 90% wood floors and that is my focus for a vacuum. After reading this review I am going to look at the V10 Absolute. I had not read about the soft roller feature before and the benefits to wood floors. Thank you for this great comparison!! You’re very welcome! I’m glad we could help, Ellen. 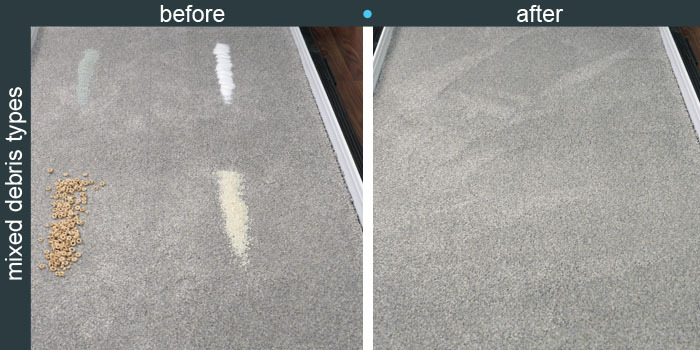 V11 could be a better for those with carpets who will really benefit from the extra suction. But with 90% wood floors, the V10 and the fluffy soft cleaning head is a must. Hi, im a bit confused by what you say comes with the absolute v the animal. On the dyson website, the absolute comes with the torque head and soft roller but the animal version does not. And both have the soft dusting brush. If the torque head is a major selling point of the v11, the animal version seems very expensive for a model that doesnt provide this. You may be looking at the V11 Absolute on the UK Dyson website or another international Dyson website. In the US, there is no V11 Absolute. There is only the V11 Torque Drive and Animal, both of which only include the Torque Drive cleaning head.